Congratulations to Vy for passing her Masters thesis defense today! 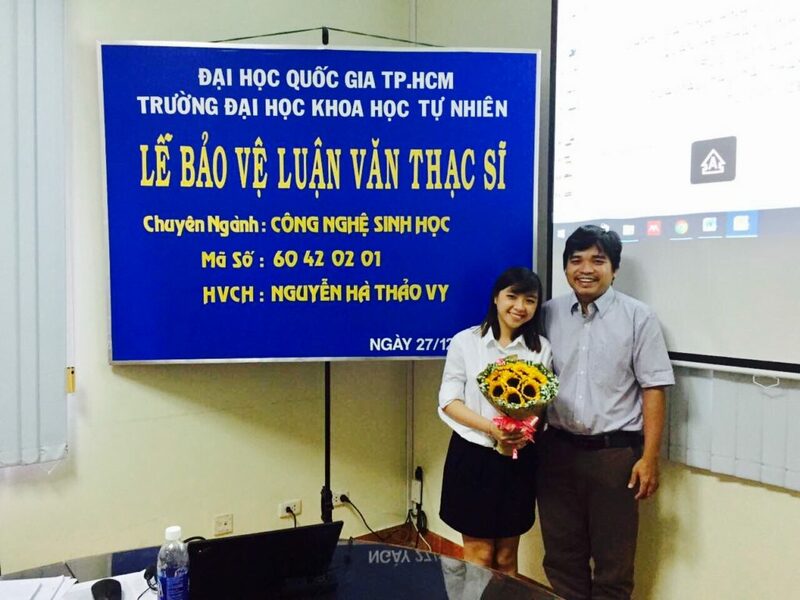 Vy’s thesis focused on the molecular epidemiology and seroepidemiology of influenza in Ho Chi Minh City, and it represented more than three years of serological and molecular lab work that Vy led, together with Tran Thi Nhu Thao and Huynh Thi Phuong of OUCRU. Vy’s main results were that influenza population seropositivity saturates between ages 5 and 10, that population seropositivity to H3N2 subtypes increased from 2010 to 2015, and that there were two strain replacements during this time. Vy pictured above left. Dao Nguyen Vinh (right) was a co-supervisor for Vy’s thesis. Vy’s Masters degree will be awarded by the Ho Chi Minh University of Science in early 2017.